When was the last time you gave a BIG THANK YOU to your Virtual Assistant? Being it is the holiday season to give thanks for the wonderful things in our lives, I thought I would give thanks to my VA too! THANK YOU Danielle Beauchemin of Proactive VA! Without you in my life my business would not be as successful as it is today. Want to show your VA how thankful you are for their services? Bring a smile to your Virtual Assistant’s face and share the special infographic below with them to thank them! Publicly post it on your Facebook wall and tag them with it. Pin it to your Pinterest account (just hover over image with your mouse and Pin Button will show to Pin it). Add it to another social network like Linkedin or Instagram together with your VA’s URL. Save image to your computer and email it to them or text message them the image. Thank you for looking after the administrative side of my business. I am now able to focus on making money within my business and have found the success I originally set out to achieve! Thank you for partnering with me and becoming a valuable team member in my business. The skills and knowledge and work ethics you have brought to my business have helped take away my daily stresses running my business. Without you getting my business organized I never would have achieved so much productive work each week. Your organizational ideas and experience have made me a better business person. I never miss important dates or appointments anymore with you by my side. Outsourcing to you has saved me oodles of money! I now don’t have to worry about high overhead costs like paying for employee benefits and health insurance, finding office space for my staff or buying office equipment to have someone work by my side. You do it so very well virtually! Thank you for taking care of all the administrative hassles in my business. I no longer have to spend hours of my valuable time in this area and I can now focus on doing what I love to most do in my business. Thank you for all the friendly customer service you have given to my customers. Your open and friendly way with people always keep my customers coming back for more and more which makes me smile. Most importantly… Thank you for picking up the pieces in my business that took so much of my time away doing by myself. Now I can spend this extra found quality time with my family and friends and enjoying life. 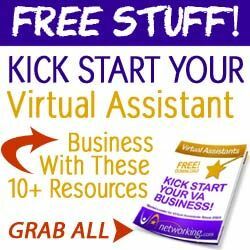 Please share with your Virtual Assistant!